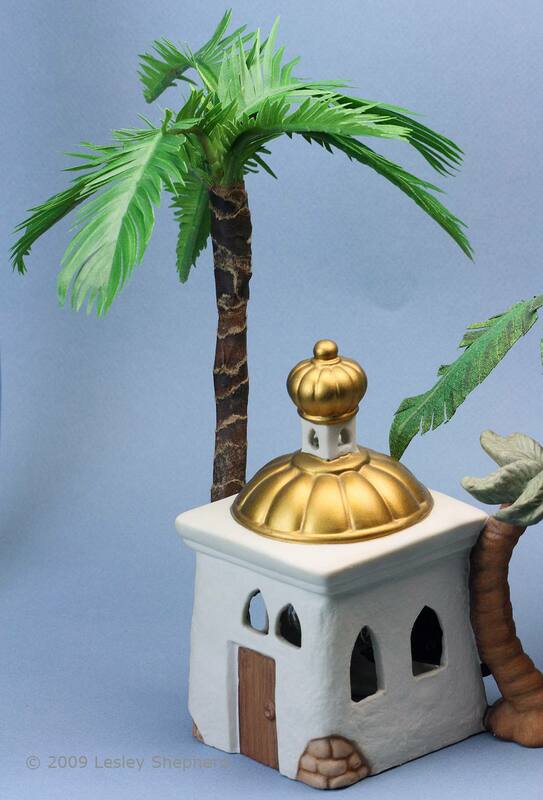 Make Miniature Palm Trees in Several Styles for Scale and Model Scenes. You can make these miniature palm trees easily in many styles and scales for all kinds of scale scenes, gaming terrains, Christmas nativities, dollhouse interiors or exteriors, even as cake decorations. The palm 'trunks' are made by wrapping wire stems with dry brushed kraft paper. The trees can be made from pre-wired fabric plant leaves available from a craft store or florist, or you can make the basic leaves from paper with a wire in the center. Before you start making a particular type of palm, study the shape of its fronds, as well as how the fronds come off the trunk, and the relative size of the fronds. For most scale miniatures, generic palm fronds should be about the size of a doorway or the height of a person in the same scale. This will create palms that appear to be in scale outdoors. Indoor palms only have trunks in conservatories. Household palm trees usually appear to spring from a tip at ground level in a pot and can be made following the same instructions, just without the trunk. Kraft Paper for the palm trunk. A brown paper bag or used sheets of parcel wrap are fine. Use thinner paper for smaller scales. Acrylic Paints in raw umber and black, to dry brush the kraft paper to give a bark effect, in dark green, mid green, and yellow-green to create palm fronds from paper instead of fabric leaves. Stiff Paint Brush for dry brushing the trunk paper, or painting the fronds. Textured Fabric Leaves in the correct color and slightly larger than you need for your palm fronds. Each palm tree will need five to seven leaves. You can substitute fabric or paper wrapped florist's wire and printer paper (tissue paper for smaller scales) if you wish. Florist's Tape You can also use masking tape, the color isn't important as it will be covered. If you want to make palm trees from fabric plant leaves, try to find a leaf with a stem long enough to form a trunk for the size of palm tree you want to make. Choose leaves which are dark green colored and have veins that curve out from the center of the leaf if possible. Try to find leaves which are paler underneath. We used magnolia style leaves here for palms suitable for a dolls house or small Christmas nativity scene. These leaves were the correct color with good leaf veins and long wire stems. Don't worry if the leaves are large; you can easily cut them down to size. You can also usually easily remove any plastic veins beneath the leaves if necessary. Check the cluster of leaves you find, to make sure all the leaves in the group are the same. In the group of magnolia leaves, We purchased at the craft store, some are dark green, and some are yellow-green. This works fine, as long as you remember to use only one kind of leaf in each palm tree. Leaves with natural wavy texture look very realistic for several miniature palms. If you want your palm to have dead fronds as well as living ones, then try to find similar leaves in light brown or yellowed colors. If necessary, you can make the dead fronds from paper and combine them with the fabric fronds. If your fabric leaf has plastic veins on the underside, peel them off the leaf before you cut it into the shape of palm fronds. The plastic veins will get in the way of your cuts for the frond. On most fabric leaves the veins will peel away from the edge back to the wire center of the leaf, where you can trim them away from the center vein. Decide what shape and length you need for the type of model palm tree you want to create. The easiest palms are date palms and phoenix palms, which have oblong leaves, which are slightly pointed at the tips. The length of the frond should be roughly equal to the height of either a doorway or a person in the scale you are working in, although they can be larger or smaller and still look in scale. For this set of instructions, we cut the rough oval shapes close to five inches long and 1 1/2 inches wide before they were trimmed. Cut your rough oval shape starting from the tip of your leaf to keep the stem of the leaf as long as possible for the palm trunk. To see a clearer example of the shape of the leaf, see the step on for cutting palm frond shapes from paper. When you have cut out your basic palm frond shape, peel any excess leaf (from the main leaf shape you started with) off the wire below the base of your newly cut palm frond, making sure the frond section is not peeled from the wire. Trim any excess fabric off the wire as shown in the photo. To make palm fronds from paper instead of fabric plant leaves, cut roughly oval shapes with a slight point on one end as shown in the photo. Double the sheet of paper to make two identical cuts for each leaf. You will need one paper leaf for the top, and one for the bottom of the leaf, with a length of fabric or paper, covered wire glued in the center (see the next step). To finish miniature palm fronds made from paper, first coat one side of an oval shape with glue, then center a piece of florists wire along the length of the oval, leaving 1/4 to 1/2 inch free at the point of the oval. Cover the wire with the second piece of paper to sandwich the wire between the upper and lower layers of the palm frond. When the glue has dried, and the wire is secured between the two layers, paint the upper and lower sides of the leaf with yellow-green paint. Allow the paint to dry. Dry brush a layer of darker green paint over the frond as shown in the photo (not all of the frond has been painted) making 'S' shaped curves in the paint that run out from the wire in the center of the leaf. This will create the leaflet veins. Allow some of the yellow layer of paint to show through. Dry brush the underside of the leaf with mid-green paint the same way, trying to line up the veins in the same direction. Set the basic frond shape aside to dry. When dry, carry on making the frond as in the instructions for the fabric fronds. You may need to touch up cut edges of the paper frond with a bit of darker green paint if the paper underlayer shows through after you cut it. Use sharp scissors to trim each of the fringed sections on your miniature palm frond to a point. The points do not all need to be the same lengths or size; all leaves vary slightly in shape naturally. Just try to keep the rough pointed oval shape of the frond close to the shape you first cut. Make at least five to seven fronds for every miniature palm tree. For fuller palms, make more fronds. When you have at least five to seven fronds for your model palm tree, gather the fronds together so that the bases of all the fronds are lined up together. Don't worry about some stems being shorter than others. If you want your palm to be thicker just below the fronds (as if it has been trimmed wider) cut some of the stems to about 1/3 to half the length of the frond, leaving enough long stems to make a full-length trunk in an appropriate thickness. When you have all the fronds lined up, gather them together at the base of the fringed leaves, with a piece of florists tape or masking tape as shown. Use florist's tape or masking tape to wrap the wires on the palm fronds all the way to the base to form a trunk as shown. If you wish, you can add extra wrappings to the upper section of the trunk to thicken it. If you use brown florist's tape, you may find your palm tree is finished enough for your purposes after this tape wrap. You can create a more realistic trunk using prepared kraft paper strips for a final wrap for the tree. Check that your trunk is the correct length for your purposes and trim all the wires, leaving one wire one inch or so longer if you want to secure the palm in a base made from a circle of wood, or anchor it into an existing terrain. You could also trim all the wires the same length and create a small plaster or polymer clay base to anchor your palm tree into position for the scene. To make the wrapping for the palm tree trunk, dry brush a long section of kraft (brown) paper with dark brown or raw umber acrylic paint, brushed over with black paint. Matt paint is more effective than gloss paint. You do not need to coat the kraft paper entirely. To dry brush paper, load your brush with paint, then tap the brush on a rag or paper towel to dry off the ends of the brush. Drag the brush over the paper covering it with light lines of paint, instead of the regular solid coating. When the kraft paper is dry, use your fingers to tear a narrow strip (less than 1/2 inch, narrower for smaller palms) along the long edge of the kraft paper in the direction you made your brush lines. Try to tear the paper in a slight zig-zag, as this will mimic the small triangular scars on a palm where old branches have fallen off or been cut away. You may need several strips of torn paper to cover the trunk of one scale miniature palm depending on its height and trunk thickness. Take your strip of prepared kraft paper and run a thin line of glue along one unpainted inner edge, this will be the bottom inside edge. Begin to wrap around the top of the trunk just under the join of the fronds to the trunk. Make sure you cover all the tape from previous steps. Wrap the top section of the palm several times to create a fairly thick top, gluing the layers together as you go, but avoid having glue show between the edges of the paper. When your trunk is the correct thickness, continue wrapping the trunk towards the base of the palm, leaving 1/8 to 1/4 inch of space between the lines of wrapping. Leave the glue to dry. To make the trunk more realistic, use tweezers or a toothpick to tease some of the zig-zag sections free of the trunk. These will give the semblance of old frond bases to the palm. To shape the fronds of the model palm tree into the proper crown shape, consult the photos of the palms you are trying to reproduce. Some palms have fronds that stand more erect than other varieties. Gently curve the wire on the back of the leaves over your hand to curve each frond into shape. If you need to store the palm between uses, you can bend the fronds back up into a tight group for storage. As the fronds are taped, but not glued together, you can also gently adjust the position of fronds in the group if necessary. If you want curved palm trees, remember that palms only curve in one direction, they make C curves, but not double S bends with their trunks. Palms also look more realistic if planted in groups, rather than placed singly in a scene.